The team returned to the U.S. in the wee hours of Friday, April 20. On behalf of the team, we can’t thank you enough for your prayers, encouragement, and support. 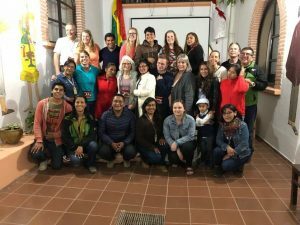 This was my second trip to Lajastambo with a Blackhawk team, and I’m once again amazed and humbled by the hospitality shown to us by the staff of Food for the Hungry-Bolivia and the people of Lajastambo. Wherever we went, people welcomed us with broad smiles and open arms, and they wouldn’t let us leave without sitting down and having a meal together. I’m so glad over half our team had a heart and a passion for children’s ministry. These team members embraced the throngs of children that followed us everywhere we went. They played with dozens of children for over three hours straight while my wife Anne and I led a marriage workshop with about 30 couples. The children absolutely thrived when our team members focused on them and played with them. They loved the attention! Food for the Hungry (FH) is doing a great work in about eight communities surrounding Sucre (which includes Lajastambo). When community leaders invite FH into their community, a variety of activities start happening on a 10-year calendar. Church partnerships are formed, greenhouses are build, community centers are constructed, health and wellness clinics are held, and groups of women learn how to bake nutritious meals and form savings clubs. The dedication, passion, and professionalism of FH staff is remarkable. While we were there only a week, the relationships we formed will leave lifelong impressions on all of us. The time many of us were able to spend with our sponsor children was unforgettable. The money you invest in child sponsorships is making a profound difference in the lives of children and their communities. Please join our team for a “show-and-tell” on Sunday, May 6 at 11am in the Fireside Room. There might even be a sampling of Bolivian cuisine! Thanks again for all your prayers and support. This doesn’t happen without you!